The Born to Design Podcast series strives to bring you inspiring stories from the design and manufacturing world. SOLIDWORKS’ Cliiff Medling hosts this heartwarming podcast with visionary Easton LaChapelle. As a young boy, Easton LaChapelle had an interest in making things…anything…with no barriers. 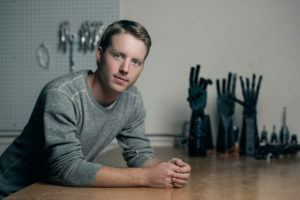 Then he thought he should build something that would help others, and decided he would design a better robotic prosthetic. With the use of the internet to learn from experts and figure out how to build more efficiently, he also learned electronics, and eventually learned how to program on an Arduino/raspberry pi type of device. Next he asked for a 3D printer for his 14th birthday, and with trial-and-error, he kept taking that to the next level, teaching himself everything he needed along the way, including SOLIDWORKS. Along this short journey (he is only 23) he has met the U.S. President, Tony Robbins, and many other influential people. He also met a young girl who needed a better prosthetic. What happened next? We’ll, you should listen to his amazing story (really, it’s quite amazing) in this podcast. You can also watch a quick video of how Easton creates his great prosthetic designs in SOLIDWORKS here. Learn more about Easton and his organization: www.UnlimitedTomorrow.com. Have questions about using SOLIDWORKS to make your design dreams a reality? Click here and someone from The SolidExperts will be happy to help.